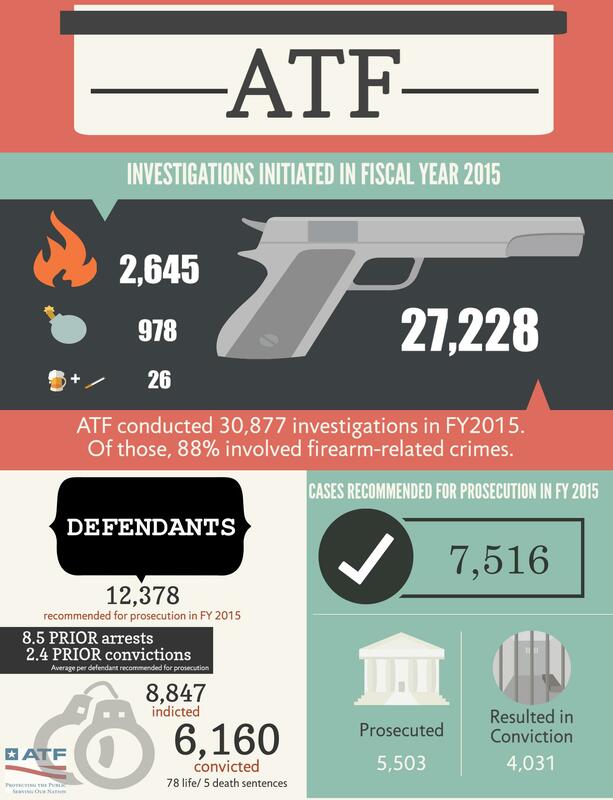 ATF conducted 30,877 investigations in Fiscal Year (FY) 2015. Of those investigations, 80% involved firearm-related crimes. ATF recommended 12,378 defendants for prosecution in FY 2015. Of those recommended for prosecution, 8,847 were indicted. Of those indicted, 6,160 defendants were convicted. and resulted in 78 life sentences and 5 death sentences. ATF recommneded 7,516 cases for prosecution. Of those recommended 5,503 were prosecuted. Of those cases that were prosecuted, 4,031 resulted in conviction.